Some devices have one job to do, but that job can have many facets. To [jmcservv], an example of this is the job of protecting against worst-case failures in a 3D printer, and it led him to develop the 3D Printer Watchdog Guardian. When it comes to fire, secondary protection is the name of the game because it’s one thing to detect thermal runaway and turn off a heater, but what if that isn’t enough? The MOSFET controlling the heater could have failed closed and can no longer be turned off in a normal sense. In such cases, some kind of backup is needed. Of course, a protection system should also notify an operator of any serious problem, but what’s the best way to do that? These are the kinds of issues that [jmcservv] is working to address with his watchdog, which not only keeps a careful eye on any heating elements in the system, but can take a variety of actions as a result. Some outcomes (like fire) are bad enough that it’s worth the extra work and cost of additional protection, and that’s the thinking that has led [jmcservv] to submit his watchdog system for The Hackaday Prize. At the risk of making a generalization, most 3D printer fires seem to be due to overheating components. Not a huge surprise, of course, as parts of a 3D printer heat up to hundreds of degrees and must remain there for hours and hours on end. Accordingly, [Bin Sun] has created a very slick device that keeps a close eye on the printer’s temperature at various locations, and cuts power if anything goes out of acceptable range. The device is powered by an Arduino Nano and uses a 1602 serial LCD and KY040 rotary encoder to provide the user interface. The user can set the shutdown temperature with the encoder knob, and the 16×2 character LCD will give a real-time display of current temperature and power status. Once the user-defined temperature is met or exceeded, the device cuts power to the printer with an optocoupler relay. It will also sound an alarm for one minute so anyone in the area will know the printer needs some immediate attention. We’ve recently covered a similar device that minimizes the amount of time the printer is powered on, but checking temperature and acting on it in real-time seems a better bet. No matter what, we’d still suggest adding a smoke detector and fire extinguisher to your list of essential 3D printer accessories. [Didier Stevens] wrote in to tell us about a little piece of PC security software he put together recently. His application, LockIfNotHot, works in conjunction with your PC as well as an IR temperature sensor in order to lock your computer the moment you step away. The theory behind the system is pretty simple. Basically, the IR temp sensor monitors when you are at your desk, sensing your presence by the heat your body gives off. As soon as you step away however, it locks the computer since the temperature of the surrounding area immediately drops. It’s pretty simple, but as you can see in the video below, it works quite well. The software has configurable set points and timeout values, which make it flexible enough to adapt to your specific situation. He happens to use an off-the-shelf IR sensor, but we assume any USB temperature module will do the trick. If you happen to work with sensitive information but often forget to lock your workstation, this is the program for you! Continue reading to see a quick demonstration of his software in action. We’ve seen automated grow boxes of all shapes and sizes, but all were for growing plants. [Jared] over at Inventgeek wanted to do something similar for his algae. He started off with an Arduino-based solution that allows the controlled pulse of LEDs connected to his standard bioreactor as a prototype. 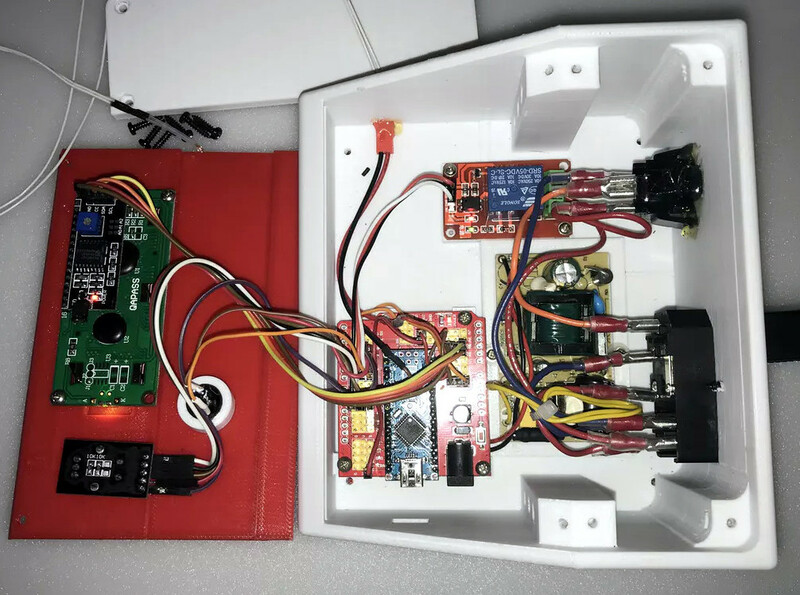 Once he determined his proof of concept worked, he began work on a design based on the Arduino Pro Mini that has more advanced features such as temperature monitoring and algae culture density monitoring via some fancy IR voodoo. The code is open source and the hardware is easily obtainable, all that remains is the desire to grow algae.